Make a statement with this bracelet that is made on expandable wire. 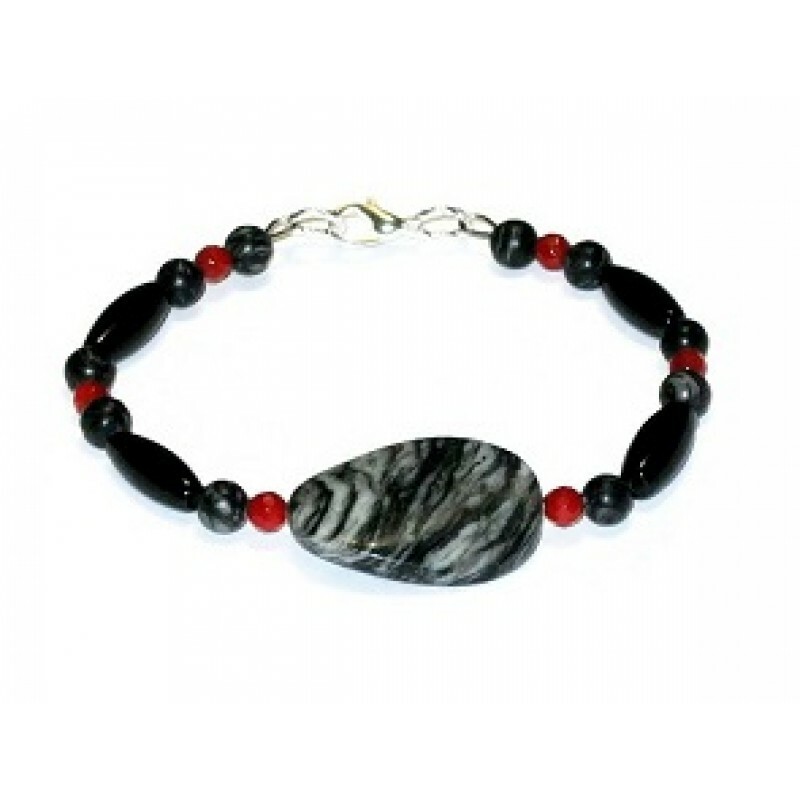 It features a oval-shaped jasper semi-precious stone which is accented with faceted jade black onyx and jasper beads. It has a silver-plated lobster clasp and measure 7 3/4 inches. This expandable choker features a matrix jasper pendant accented with black onyx, jade, ja.. This statement necklace features jasper striped stones, Swarovski crystals and an assortment of blac.. The sterling silver oval components on these earrings are accented with Swarovski crystals. .. This red ring can command attention! It features 3 carved semi-precious flowers wrapped with non-t.. The red coral bamboo semi-precious beads hang on sterling silver components which are complemented w.. This stylish expandable choker has a botswana pendant which is highlighted with Swarovski crystals, .. These unique and stylish earrings feature carved red semi precious flower beads, Swarovski crystals,.. These earrings feature jasper and onyx semi-precious beads which are highlighted with Swarovski crys.. This fashionable expandable choker features a jasper semi-precious stone in the center that is accen..